I love labyrinths. They come in all shapes and sizes, both ancient and modern, and have a rich global history. 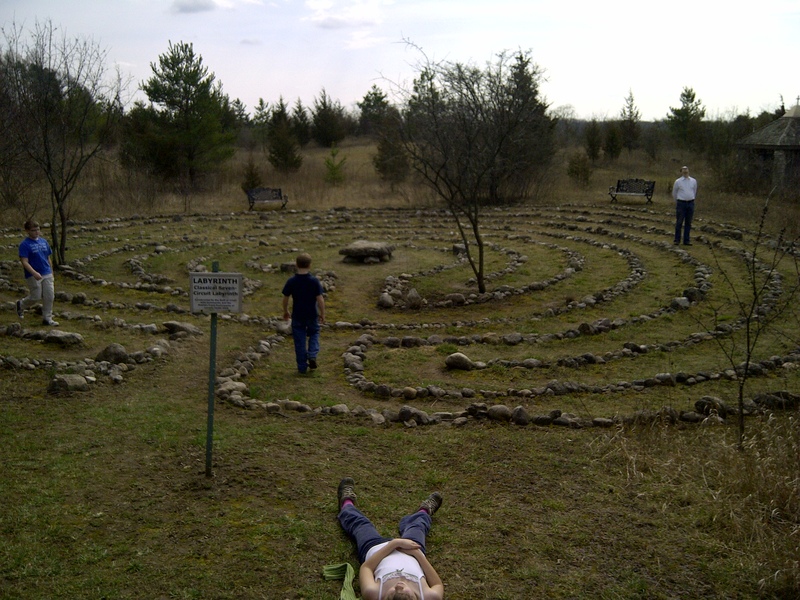 Walking the labyrinth is a helpful spiritual practice for me. My feet take up the slow, steady guided steps, leaving my mind free to meditate and pray. It is restful. Since my church does not have one (nor do I have a yard big enough to make my own!) I visit them when I have time. 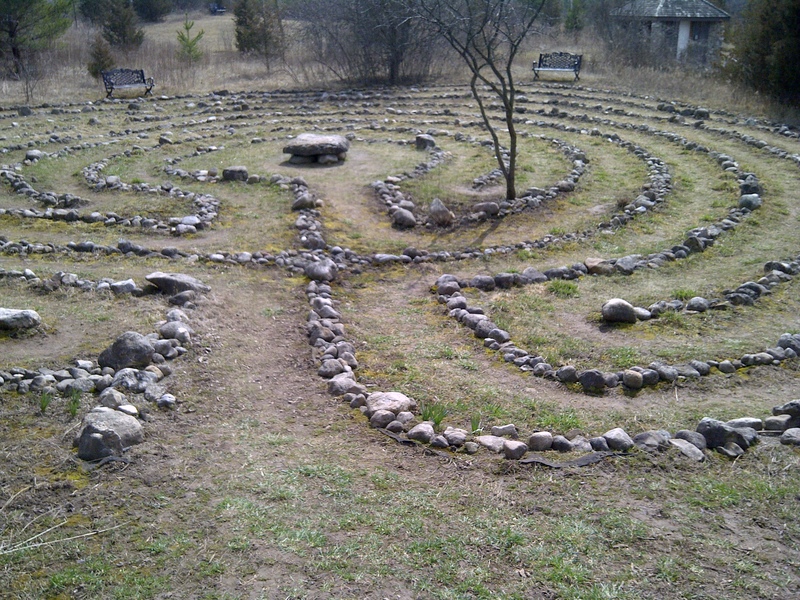 A few weeks ago I went with some members from my congregation to Crieff Hills, south of Guelph, to walk the one there. It was a warm, sunny afternoon–an unexpected gift in the middle of March. The tree branches were still bare, but the birds were singing their relief that winter was over. 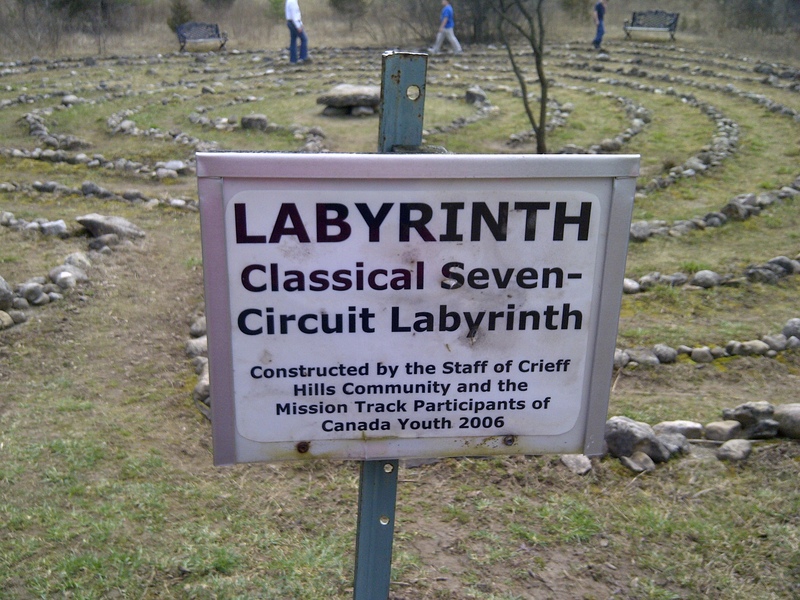 That particular labyrinth was constructed on the grass, with stones lined up in a classical seven circuit pattern. Weeds were growing here and there, providing the first small tufts of spring green. Interestingly, the creators left several young trees in the pattern, which must provide lovely cool shade in the heat of the summer. Nearby benches offer a place to sit, although some of the people I was with preferred to simply stretch out on the grass. Each of us took our turn slowly walking in and out again. The children may have walked a little quicker than the adults, but even they seemed to sense that this was a place to be quiet and slow down. We stopped to notice the blue of the sky, to hear the wind through the trees, and to sense the mysterious presence of God. Some wandered off after they were finished, others sat nearby. We eventually made our way back to the gravel parking lot. It was over all too soon. Having left the hush of the labyrinth we found ourselves laughing and talking again, with teenagers stealing each other’s baseball caps and children asking for a snack. And yet our conversation was just a little bit warmer, our faces a little more relaxed. We had stepped out of our frantic daily routine–just for a moment–and it showed. I will not have the privilege of visiting such a lovely space this week. There will be no field trips for pastors in the midst of extra services and Easter preparation. I am fed, however, by the memory of that quiet afternoon. All I have to do is close my eyes and I am transported back, if only for a brief moment, to drink in the spirit of calm. Sometimes, I think we underestimate the future value of our present moments. We derive great benefits from living in the moment, to be sure, but there are gifts to be had from our recollections, too. Especially when our present is not all we might wish for–perhaps we are too busy, too frustrated, or too far away from home–we can find sustenance in past moments of blessing. As I go off now into an intense week of work, worship, and family I am keeping this in mind. What I do today may well create a moment of refuge, satisfaction or inspiration for tomorrow. This entry was posted in Uncategorized and tagged church, inspiration, labyrinth, life, memories, prayer, rest. Bookmark the permalink.